Feline Leukemia Virus (FeLV) is a very serious blood cell cancer for which there is no effective treatment or cure. Some drugs have been tried to stimulate the immune system but to date none have shown conclusive results in combating FeLV. Fortunately, there are reliable screening tests for FeLV which enable the identification of sick cats and healthy cats which carry the virus. Not all cats who contract FeLV will die from the disease but they all need to be closely monitored. FeLV will sometimes effect, a cats immune system so that other diseases will make it extremely ill. Blood cell and bone marrow production may be suppressed and lymphatic cancer may develop. Some cats can contract FeLV and yet live normal lives without becoming ill because their immune systems prove capable of fighting off active infection - but normally, when a cat develops clinical signs and tests positive for FeLV its life expectancy will most likely only be a few months. Kittens are particularly at risk because of their underdeveloped immune systems were so it's important to vaccinate them against Feline Leukemia (also spelt Leukaemia). Feline Leukemia Virus is contagious and passed by cat to cat contact such as biting, fighting, mutual grooming and from a queen to the kittens. It can be transmitted through various mediums including blood, urine, mucus, faeces and saliva. appetite, weight loss, anemia, jaundice, diarrhea, constipation, excessive drinking, enlarged lymph nodes, lethargy and respiratory problems. A test for feline leukemia can be carried out your vet clinic and you will normally be able to get the results within minutes. Testing may be carried out through samples of blood, saliva or tears. Tests are usually very reliable but need to be verified when they show up as positive, because false positive results are sometimes recorded for the FeLV test. Most clinics will check for FeLV antigens in the blood. Another type of test can check for viral DNA in the blood (FeLV PCR). There can sometimes be complicating issues when testing - for example, if a cat was exposed to the virus a few weeks before being tested, the test may prove a negative, because viral antigens wouldn't be present in the blood yet. - Neuter and spay your cats so they're less likely to fight or come into contact with others with FeLV. - Do not introduce a cat or kitten into your household which has not been tested for FeLV. - Keep pet flaps and the doors locked to prevent unknown cats entering from outdoors. 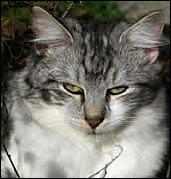 - If your cat or kitten goes outdoors make sure it is vaccinated against FeLV. There there is no known cure for FeLV but a course of treatment can be undertaken with the aim of making the remainder of a cat's life as comfortable as possible. And when an animal responds positively to treatment they may live for several years. FeLV does not live outside of infected cats and cannot be transmitted via humans from one cat to another - but it's advisable to wash your hands and clean thoroughly if you've been in the vicinity of an infected cat or kitten. A safe and natural product to help your cat maintain overall cell health and immune system support.